SAN DIEGO, Calif. - February 14, 2019 - Peterbilt Motors Company names The Peterbilt Store as the 2018 Dealer of the Year. The award was presented at the 2019 Peterbilt Dealer Meeting held in San Diego, California. The annual two day business meeting brings together Peterbilt dealers from across North America. The meeting includes presentations and breakout sessions, with focused reviews on strengthening the dealer network and providing an industry-leading sales and service experience to customers. "The Peterbilt Store has made significant investments in state-of-art facilities in multiple locations and it has paid off by making them one of the top performing dealer groups across several key metrics," said Jason Skoog, PACCAR Vice President and Peterbilt General Manager. "Their commitment to driving uptime for Peterbilt customers is something our entire dealer network should be proud of. The Peterbilt Store is a fantastic example of the customer centric reputation Peterbilt is known for. I thank them for that commitment and for representing our brand and products in a way we all take pride in." In addition to the 2018 Dealer of the Year, The Peterbilt Store also takes home six Platinum Oval awards which is given to the group of elite Peterbilt dealership locations who have demonstrated outstanding performance in all aspects of the Peterbilt Standards of Excellence program as well as 2018 Best in Class award which honors the dealer organizations that rank the highest across the North American dealer network. "It's very rewarding to see the hard work of our people recognized with such a prestigious honor," said John Arscott, Chief Executive Officer for The Peterbilt Store. 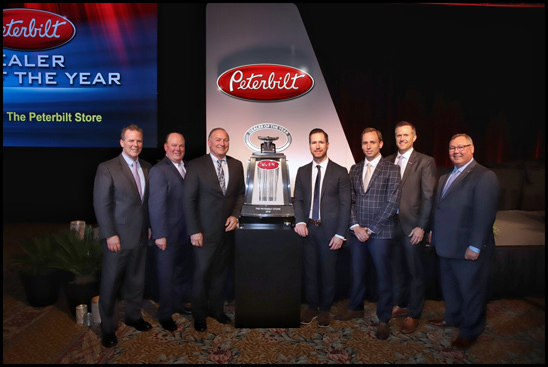 "This marks the second time in three years we have been named Peterbilt North American Dealer of the Year, recognizing our long-term commitment and consistency delivering exceptional customer support." This is The Peterbilt Store's third Dealer of the Year award, adding it to their awards in 2004 and 2016. The Peterbilt Store operates 16 dealership locations across seven states and finished 2018 as one of the top performing dealerships in parts and service, medium duty sales, Class 8 sales and MX engine sales. The Peterbilt Store is one of the many leaders of the Peterbilt dealer network, serving on the Peterbilt Dealer Council which guides the development and growth of the overall dealer network.